If we’re friends on facebook, you may have seen my posts about baking with cricket flour. I figured I’d write up the whole experience here since this is an easier format for a longer post. I’d been a vegetarian for a long time for environmental and sustainability reasons. I recently added a small amount of meat back in to our diet since we can buy directly from farmers. I’ve been reading more and more about insects being a sustainable source of nutrition — for instance, crickets need 6 times less food as cattle to produce the same amount of protein (source: Food and Agriculture Organization of the UN). Which is all well and good, but still. Bugs. I consider myself a pretty adventurous eater, but … bugs. So the other night at dinner, we were playing a question game, in which one person asks a question and we go around the table and everyone answers. The question was, “what food would you like to try that you’ve never had before?” I answered that at some point, I would like to get over my squeamishness and try insects. I’ll admit that when I said that, I was figuring that I had a few years before I’d have to do that. Chris figured there’s no time like the present, though, and ordered a couple of bags of cricket flour for me. 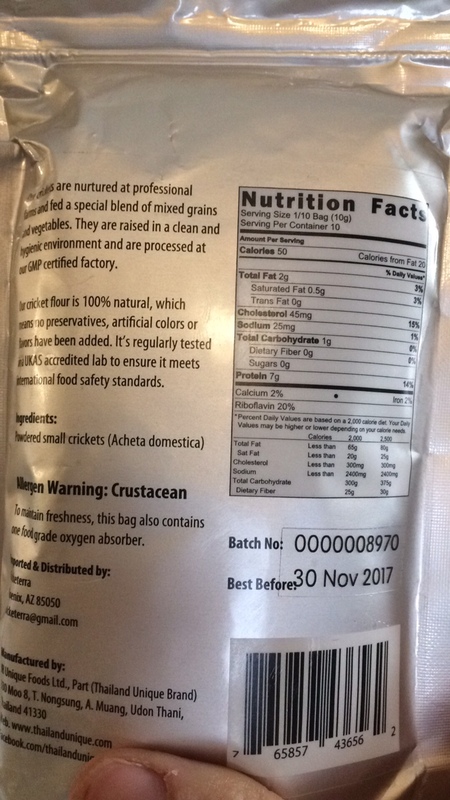 note the important allergen warning if you have a crustacean allergy. From Food and Wine, 6 recipes to try with cricket flour – Important Note: This article mostly talks about a specific brand of cricket flour you can buy that has other ingredients added in so that it can replace regular flour 1:1 in recipes. That is NOT the case with 100% cricket flour like I have. 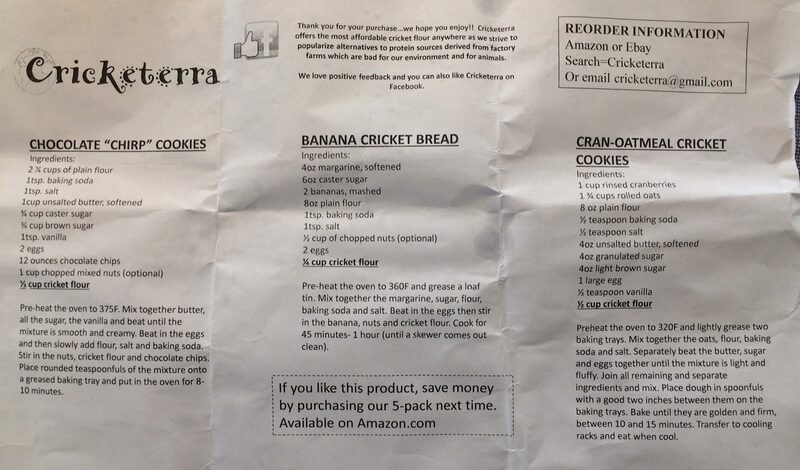 Also note, they had not actually tried baking any of these recipes with cricket flour, they just think they sound like they’d go well… Remember that. From Lucky Peach, Baking with insect flour (Lucky Peach is no more, so this link no longer works either) – my big take away from this is that cricket is the absolutely best choice when it comes to insect flour. Also that I have a big, bright line in what I’m willing to consider eating and scorpion flour is way the heck on the other side of that line. And finally, I found an article that was actually helpful: Baking with cricket flour is not a gross as you think. From that, I got the information that you can sub up to 1/3 of flour in a recipe with cricket flour. Any more and you start really mucking with the texture. After reading through a bunch of different recipes, I finally decided on 4 different ones to try today. I was looking for a variety of flavors and textures, but wanted to stick with flavor profiles that went with what I’d read was the cricket flour flavor – nutty and a bit malty. I also went mostly sweet with these, with one exception. I have a really strong sweet tooth, and if I’m going to get past my squeamishness around eating insects, using sweets and chocolate are probably the way to do it. During my research and discussions on facebook, I came to the conclusion that cricket flour is probably most like a nut flour in that it’s high protein, but will add absolutely no gluten. I bookmarked a recipe for nut flour macaroons, but I just couldn’t bring myself to bake something that was just crickets, sugar, and egg white. Maybe next time. Savory oatmeal cookies (from the Kitchn.com). This last one was inspired by the picture of the apricot tarragon cocktail cookies, which look gorgeous and savory (even though they’re not). As much as I love sweets, I can’t eat them in the mornings (lest I have a distressed stomach), and I’ve been looking for a high-protein breakfast food that’s not sweet and is easy to grab and eat as I walk the 3 blocks to the vanpool pick up. This seemed like an intriguing possibility. 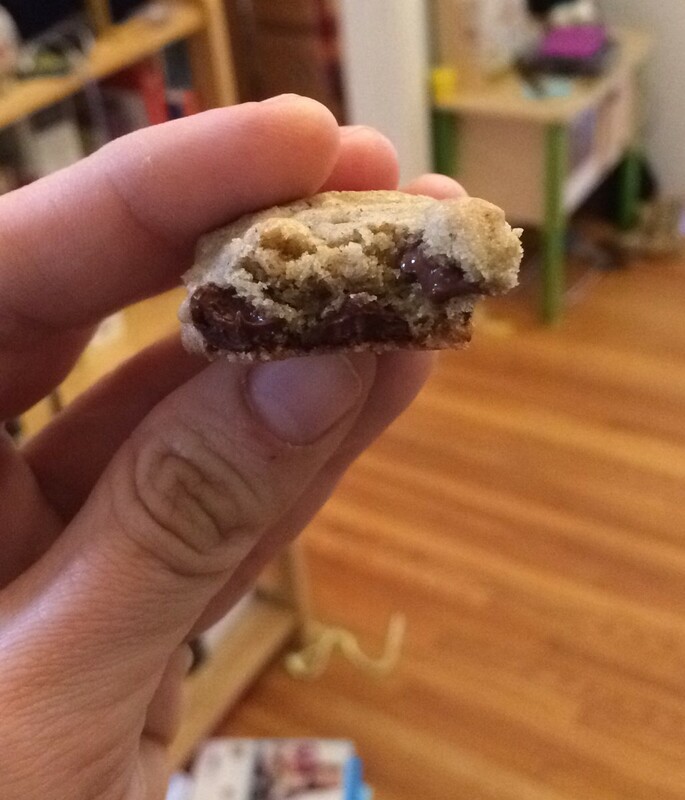 In all but the chocolate “chirp” cookie recipes, I decided to replace 1/4 of the regular flour with cricket flour — I just followed the chocolate “chirp” cookie recipe as written. 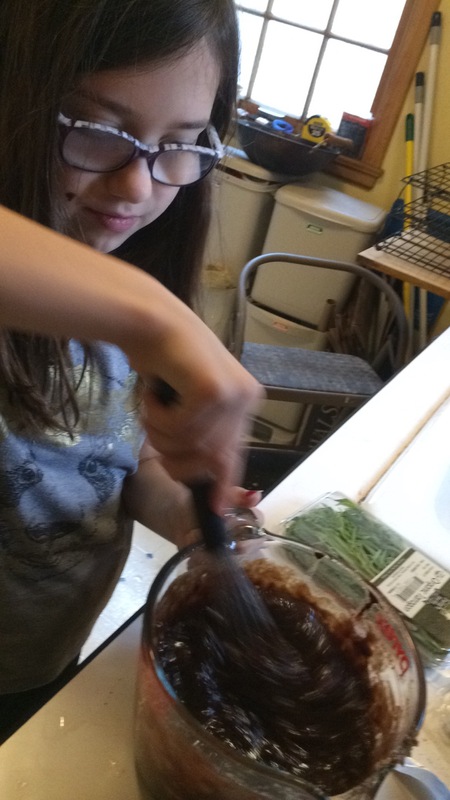 Zoe was excited to help me with the baking, though she wasn’t sure about actually handling the cricket flour. Once we got going, though, she was totally fine with it. The cricket flour looks like a light brown powder. It’s just a little bit grainy and it smells like something I can’t quite identify (maybe because I’ve never bothered trying to smell crickets before). It doesn’t smell bad, though. It mixes up well with flour, but it does make batters a darker color than they’d normally be. We started with the brownies, which have very little flour to begin with. The recipe calls for 1/2 cup of flour, so we did 1/8 cup cricket flour and 3/8 cup regular flour. 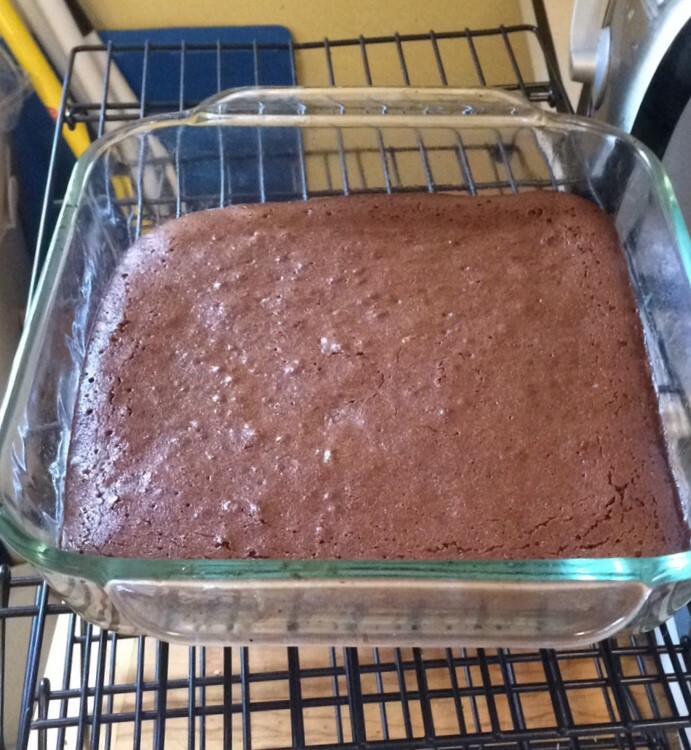 The brownies smelled great, just like regular brownies. …and they tasted really good, too. The recipe mentions that if you use pastry flour instead of all-purpose flour, you’ll get a more cake-y texture. These brownies are definitely a little on the lighter, cake-ier side, rather than really dense and fudge-y. Hazel has eaten at least 3 of them by last count. If you have to convince someone that cricket flour is not bad, this is a solid choice. That is, if they like chocolate. Zoe’s not a chocolate fan, so she declared these “too chocolaty”. 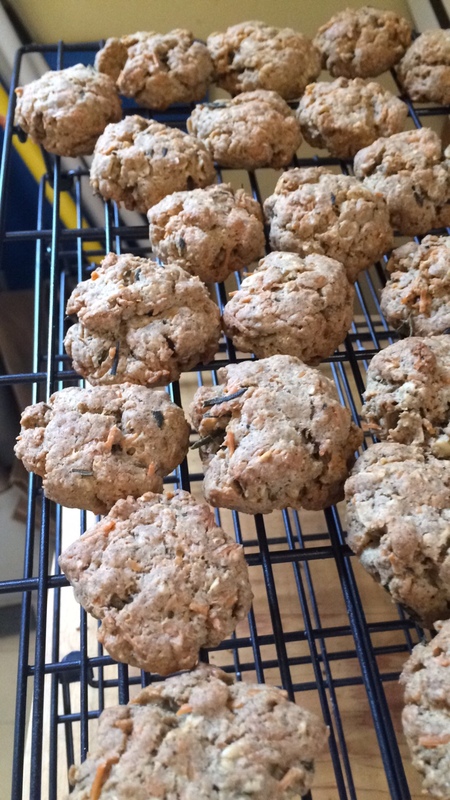 We made the savory oatmeal cookies next, using the recipe, but I didn’t sprinkle any salt on top. I also didn’t hear the timer go off, so these had an extra few minutes in the oven. But I think they still turned out ok. I mean, rosemary, parmesan, and cracked pepper is a pretty nice combination. There was just a hint of graininess to the texture, but not in a bad way. I think these are the ones I’m most likely to make again, and seem to lend themselves to playing around with other savory flavor combinations. 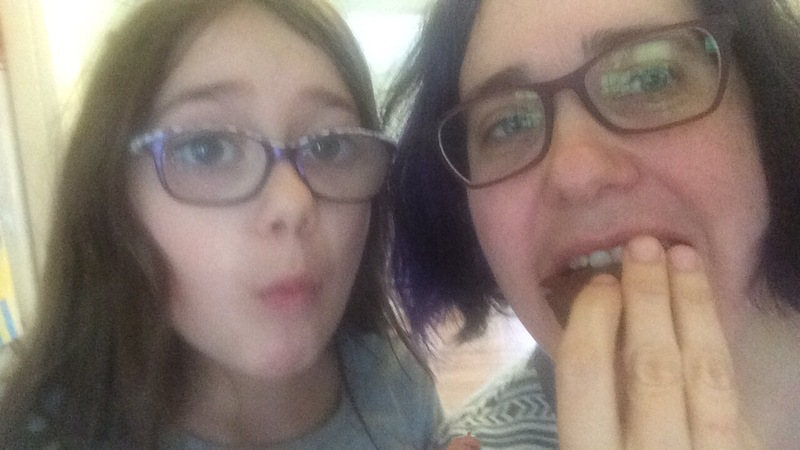 Neither Zoe nor Hazel liked these, but I think that was because they are savory, not because they’re bad. 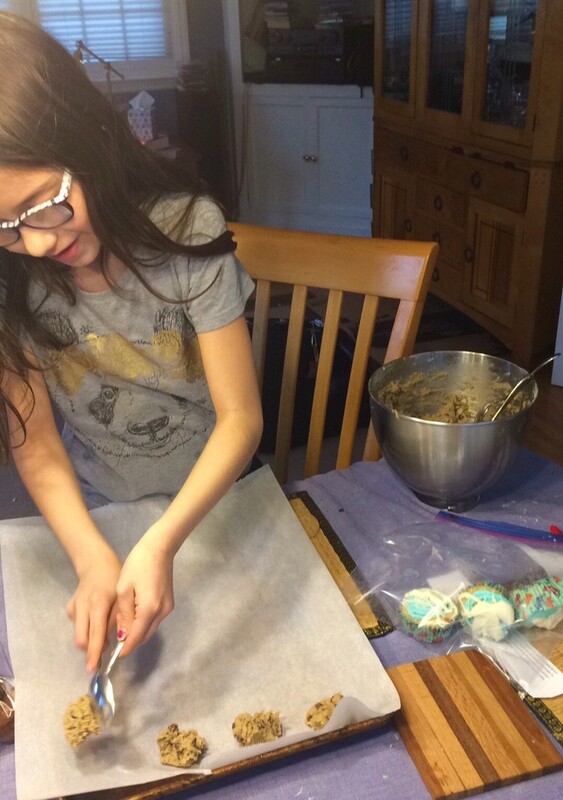 The recipe is a pretty standard chocolate chip cookie recipe with lots of chocolate chips. And a half cup of crickets. The cookie dough is slightly darker than you’d expect, but otherwise looks and feels like normal cookie dough. They bake up just like chocolate chip cookies, too. …and they taste really good. Again, just a bit of graininess. If I didn’t know what was in them, I’d probably assume that someone had put in a little bit of whole wheat flour. This would be my other choice of a recipe to use to convince someone to try cricket flour (assuming they like chocolate chip cookies). I made these mostly because the picture was just so beautiful and tempting. Just look at those beautiful rounds with bright herbs and golden apricots. Yeah. Deceitful pictures, those. There is something deeply wrong with these cookies and I don’t think it’s the cricket flour. The raw dough was just really unpleasantly soft. It has to be frozen for an hour before you can cut them out, and as it thaws it just kind of disintegrates. Bleh. The flavor isn’t great, either. You’d think with the tarragon and the apricots that there’d be some interesting flavors, but they really don’t taste like much at all. Not recommended. I didn’t even get good pictures. 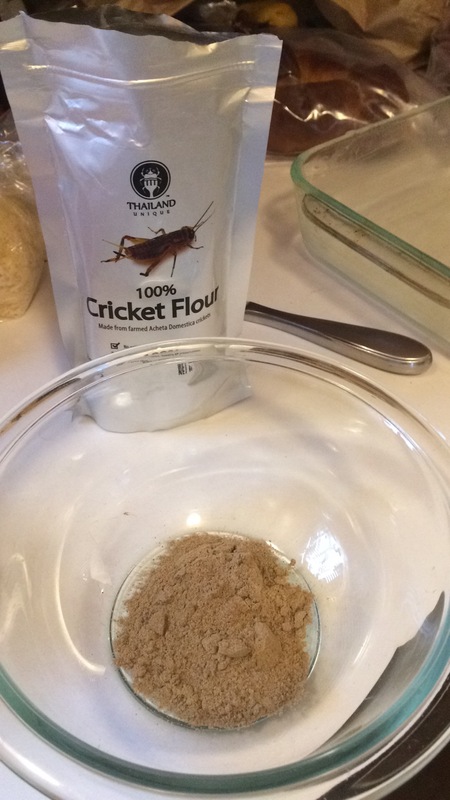 Cricket flour baked into things is just fine if you don’t replace more than 1/4 of the flour with cricket flour. According to one article, you can replace up to 1/3 of the flour, but I wouldn’t go more than that. The difference in texture is noticeable, but not unpleasant. These experiments got me to taste cricket flour and I can say that it was fine. That said, the subconscious is a really interesting thing. Even though I’d tried the baked goods and liked them, I did not eat them mindlessly the way I normally eat sweets, and I didn’t lick the bowl or the spatula, either. That’s possibly worth keeping in mind if I want to have sweets in the house but I don’t want to just eat them mindlessly. At the ratio I used, you’re not actually increasing the protein value of the baked goods by all that much. By my rough estimate, if you eat 6 chocolate “chirp” cookies, you’ll get 1g more protein than you would with regular chocolate chip cookies. While I liked 3 out of the 4 recipes we made, I’m not sure I’ll make any again unless someone asks me to. Cricket flour is expensive (based on a really quick Amazon search, cricket flour is around $2.28/ounce — by comparison, almond flour is around $0.50/ounce), and as mentioned above since you’re not using a lot, I’m not sure it adds much nutritional value to a treat that people tend to eat sparingly anyway. I really like the idea of the savory oatmeal cookies, and I plan to play around more with those recipes. The four recipes used up a 3.5 oz bag. I have another bag left, I need to think more about other ways to use the cricket flour. I’ll post if I come up with anything interesting. based on your description my first thought was gumbo – that won’t use a who lot of the flour, but could be interesting. Then I thought of biscuits and mushroom gravy… have fun and thanks for sharing! I say go big on the next bag. Make pancakes or tortillas or muffins or English muffins. I was thinking that it would make a really good shortbread crust.